In talking with parents at our local workshops and across the country I find that the order of building the car is quite misunderstood. In many cases, people shape the car body before making any provision for adding weight. In other cases, the body is built without axle slots or holes, with the intent of adding them later. While these unorthodox methods of building a car can sometimes yield good results, more often the car building experience is frustrating. Today’s article will provide a proven car build progression, using the Wedge as an example. This particular design, which adds some flair to the basic wedge design, can be easily built with basic hand tools. But, regardless of the final shape of the final car, the basic build progression still applies. The first step is to examine and prepare the axle slots (or holes). Check the slots to make sure that they are cut square to the block, and if not replace the block. Then insert an axle (preferably a spare axle) into each position, and remove it. This will open up the slots so that when the wheels are installed, the axles will go in a little easier. A more accurate way to prepare the slots is with a Pro-Body Tool. This tool will prepare the slots and correct for slight slot deviation. The tool will create a deeper slot if you want a raised front wheel. Next, mark the block and drill the weight holes, or create weight pockets. For the Wedge SE, two deep holes are drilled in the back of the car, and three shallow holes under the car to accommodate lead wire. Estimate the percentage of wood that will remain after the car body is complete. For example for the Wedge SE, the percentage is about 40 percent. Multiply the weight of the block times the percentage remaining. Weigh the wheels and axles (stock BSA wheels and axles weight about 0.6 ounces). From five ounces, subtract the block weight (from step 3) and the wheel/axle weight (from step 4). This is the amount of weight that will be required to bring the finished car to five ounces. Next, weight is inserted into the back holes, the holes are plugged, and the block is marked for the main wedge cut. After the glue dries, the excess plug is cut off, the main cut is made, and the top is sanded smooth. Next, the lines for the bevels are marked on the block. The bevels are then cut and sanded smooth. The nose of the car is then rounded with sandpaper. Finally, the entire car is sanded with 120 and 220 sandpaper. You can prime the car at this point, but if you want a nicer finish, a thin layer of body filler, such as Bondo, can be smoothed over the car. When the filler dries, sand it smooth. Then prime the car with two or more coats of a quality primer. Lightly sand with 600 grit paper between coats. To simplify painting, try inserting a long screw into a weight hole in the bottom of the car. This screw serves as a handle for holding the car while painting, and also as allows the car to be attached to a hook or line for drying (I use a binder clip on a piece of wire that is strung between two legs of a workbench). Next, apply the finish coats. I recommend Acrylic Lacquer paints, such as Krylon. Avoid enamel paints, as they have a long dry time and tend to stay tacky for several days. To avoid runs, apply several thin coats instead of one thick coat. Make sure to read the paint re-coat instructions. Some paint allow recoating within one hour, or after 24 hours. What happens if you recoat in between? Trust me, you don’t want to know! Detailing is a completely personal choice. Below are several possibilities for completing this particular car. For a two-tone paint job, paint the main color, and allow it to dry. Then mask with painter’s tape and paper, and apply the second color. Pinstriping can then be applied to cover the area where the colors converge. Whether you build a simple wedge, or a complex design, I strongly recommend using the build order described here. By ensuring that the axle mounting system is established first, and the ballast weight is accommodated next, you will be on your way to building a great pinewood derby car. This is my son’s pine wood derby car from last year. It took best in show and 1st Place in the races. Luke did all the cutting, drilling and painting for the car. He also did most of the work on the axles and wheels, which as your readers know, is a lot more important than aerodynamics. We came up with the idea of the name plate as a car after making some when we first purchased the scroll saw. I wasn’t sure it would work, but in the end, it wound up being a cool design that is all his, literally. By the way, I think the scroll saw is the perfect saw for a youngster to use for cutting out a derby car. He still takes a risk of getting cut, but is very unlikely to loose a finger! If you look carefully, you can see in the picture where we had to glue the car back together after accidentally going too deep when drilling holes through the backend to hide the tungsten fishing weights. The center of gravity on the car wound up being less than an inch in front of the rear wheels in spite of the forward mass of his design. We had a lot of fun working on the car together. It will be interesting to see what he comes up with this year. This is the 2007 car my son made for last years race. He sanded the body and polished the axles for days. He got to use spray paint and mix epoxy for the first time ever. He added the sticker and metal tape for the windshield. The lines on the windshield are windshield wipers that he drew with a Sharpee! The paint was Rustoleum’s red “Hammered Finish” spray for a neat textured effect. We spent a very long time getting it to roll straight. My son used your Pro-Axle Press on about twenty BSA kit axles and we picked the best 3 (the front left wheel is raised). We used six of your tungsten plates to add weight while keeping the profile low. The weights were expoxied into depressions we carved in the underside of the car. We added small wood screws to the side of the car in case it was over weight at weigh-in for easy weight removal if required. The CG was only about .85 inches in front of the rear axle and that was probably too agressive as it did shimy a bit in the flat part of the track. In the end it paid off as his car was fastest in the den and pack, and second fastest overall in the district. I think this tremendous success is mostly attributable to equal parts luck and the time spent getting it to roll straight. I have no idea how we’ll follow up that performance this year! Call me paranoid, but I sometimes suspect that the Boy Scouts of America was formed as a means to relieve parents of their grip on sanity. Don’t get me wrong, I think there are many positive attributes to the scouting program, and just as soon as I come up with some, I’ll be sure to list them. In the meantime, I feel compelled to discuss what I believe is a subversive attack on harmonious family relationships. This attack is sly, and innocuous in appearance, yet remarkably effective. One event in particular often turns normally peaceful and sane parents into competitive raving maniacs. I speak of course, of the Pinewood Derby. For the uninitiated, the Pinewood Derby is an event that features races with small wooden cars. The scouts and their parents are given a block of wood, a set of wheels and a hearty “Good luck!” before the scout leader beats a hasty retreat, not to be seen again until the evening of the race. His disappearance helps facilitate the plot against parents by depriving them of anyone who can answer questions. Some people have asked why we must put our sons and ourselves through this experience. The answer is simple: the Pinewood Derby aids in the development of our young men, so that one day when they go out into the world and decide, for whatever reason, to make cars out of blocks of wood, they’ll be prepared. I have fond memories of the Pinewood Derby. I have three brothers who were all Boy Scouts. My father was something of an expert on cars in addition to being very artistically inclined. Each year, he produced beautifully crafted Derby cars. I was never permitted to actually handle these little works of art and neither were my brothers. In retrospect, I realize that preventing my brothers from helping with these projects probably defeated the purpose. 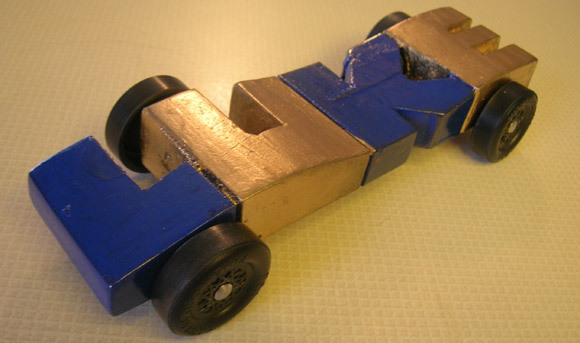 Making a car for the Pinewood Derby has the potential for being a great opportunity for parents and their children to spend time working together on a project. This was not the case at our house, however. The car was Dad’s project. The only responsibility my brothers were allowed to assume was harassing Dad and sneaking into his shop to play with the cars when Dad wasn’t looking. After spending a great deal of time doing research by looking on the Internet and speaking to every scouting father he knew, Michael then interviewed my father, gleaning advice to help make this rite of passage as successful as possible. He returned home from work the next day informed and ready to begin. “I’ve got it all planned. I know how to build the fastest and best looking car ever!” While Michael explained the importance of weight placement and the best way to carve the car, I indulged in fantasies of the happy bonding time my husband and our son would enjoy. I imagined them working in the garage, smiling at each other and having deep, meaningful conversations. I know I certainly enjoyed the peace. At least, it was peaceful until they came in the house and shattered my Norman Rockwell-like visions of father and son working together to craft a handmade toy. After my little son stomped up the stairs and slammed his bedroom door, Michael emitted a sound that registered somewhere between a frustrated sigh and an infuriated howl. Approaching carefully, I put my arms around him and asked, “That bad, huh?” Mike sighed again and sat down wearily. He folded his arms across his chest, tipped his head back and closed his eyes. “I think we should withdraw our son from Boy Scouts.” I moved behind him and rubbed his shoulders. “Of course not, but I do, and he won’t listen.” I thought for a moment about how to impart my thoughts tactfully. I reminded Michael that young boys were also creating the other cars, so I was certain that the cars would all be equally stupid looking. I realize now that this was the foolishness of inexperience talking. In addition to Michael’s competitive nature, there was another problem. Mike is a perfectionist. Anything he produces or oversees must not only be better than anything else, it must be flawless. Our son, on the other hand, isn’t terribly concerned about perfection. Like many boys his age, he didn’t really care what the car looked like, he just wanted the wheels attached so he could play with it. The next evening, the second battle of the Pinewood Derby car took place. Hoping to prevent another scene, I gave Mike a pep talk before he headed out to the garage. “Remember, this is about having quality time with your son. You can either create memories of working together that he’ll think of fondly, or let him make memories of being told to sit still while his dad built this car without him. Just remember, it’s his car, not yours.” Mike saluted me comically. “I see. So do we send him to military school now or should we try counseling first?” He eyed me in disgust. “Michael, it’s HIS car. If he wants to paint it orange with pink polka dots, that’s his choice.” Mike looked at me in horror. The races began, and I watched as my son cheered for his car. Michael was deeply engaged in conversation with the other fathers, speculating about the importance of weight placement. This only made things worse for Michael. He returned to my side uptight and concerned. “Now what?” I asked, even though I really didn’t want to know. “No. No I don’t. But I’d like to remind you that you don’t either. Our son has a car in the race, and it might be nice if we focused on him, don’t you think?” Michael had the decency to look a bit chagrined. Our son’s car performed reasonably well. It didn’t win, but it wasn’t last either. The important thing, in my opinion, was that our little boy, despite his disappointment, was able to congratulate the winners. He had a wonderful time, and in my ignorance, I thought that was the point. Michael and I congratulated our son on his car’s performance and more importantly on his good sportsmanship, then we watched as he returned to the racetrack where the other boys continued racing just for fun.Michael waited until his son was out of earshot. “Is it really wrong that I wanted my car to win?” he asked. I refrained from rolling my eyes. Okay, I waited until he couldn’t see me, and then I rolled my eyes. As I gave him a hug and tried to offer comfort, I glanced over his shoulder to see several wives also comforting their husbands. One wife was tugging her husband out into the hall to quiet his ranting and sputtering about an unfair start. “You mean the way you did all the work on your son’s car?” his wife replied. I decided to make my escape before I burst out laughing. I looked about the room and saw determined looks on the faces of the fathers in the room. I also noted the equally resigned looks on the faces of the mothers. A year ago, I was new and naive. This year I am an experienced mother of a Boy Scout. More important, I’m the wife of a Boy Scout’s father. I know exactly what to expect and how to handle it. That is why I’m headed to an undisclosed location just as soon as I’m packed. It’s not that I don’t plan to help, though. Before I leave, I’m going to christen the boat. In tiny letters, I shall paint the name “Titanic” on the little hull. I’m hoping it will help Michael set his expectations at a realistic level. If nothing else, it might make the other moms laugh. If there are any mothers present, that is. I’ve extended an open invitation to all the moms to join me in my getaway. Should I paint the bottom of the car? I didn’t know if painting the weight holes before inserting the weight with epoxy glue would hurt anything. I normally paint underneath the car, but I know that some don’t. It works okay either way. Just don’t put on an excessively thick layer of paint as the weights might not fit. What is your experience/opinion on the effectiveness of jewelers rouge as an axle polish? What is the grit rating? Rouge does a good job for final polishing. There are several different kinds of Jeweler’s Rouge, and each has a different grit size. But I believe that the typical red rouge that you find is about 2500 grit. To use rouge, dampen a soft rag, and wipe on the rouge. You just want a little rouge on the wet rag. Then apply to the spinning axle, and buff off the excess.